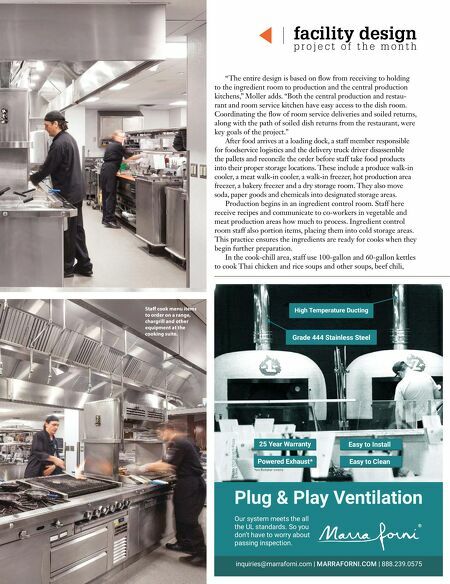 facility design p r o j e c t o f t h e m o n t h High Temperature Ducting Grade 444 Stainless Steel Plug & Play Ventilation Powered Exhaust* 25 Year Warranty Easy to Clean Easy to Install inquiries@marraforni.com | MARRAFORNI.COM | 888.239.0575 Photo: Old Scratch Pizza & Beer, Dayton OH *on Rotator ovens Our system meets the all the UL standards. So you don't have to worry about passing inspection. "The entire design is based on ow from receiving to holding to the ingredient room to production and the central production kitchens," Moller adds. 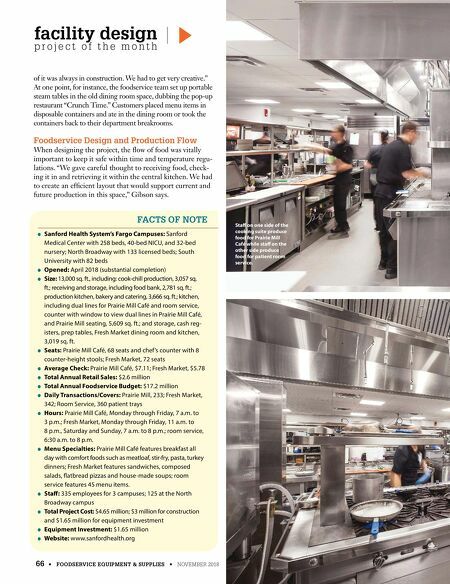 "Both the central production and restau- rant and room service kitchen have easy access to the dish room. Coordinating the ow of room service deliveries and soiled returns, along with the path of soiled dish returns from the restaurant, were key goals of the project." After food arrives at a loading dock, a staff member responsible for foodservice logistics and the delivery truck driver disassemble the pallets and reconcile the order before staff take food products into their proper storage locations. These include a produce walk-in cooler, a meat walk-in cooler, a walk-in freezer, hot production area freezer, a bakery freezer and a dry storage room. They also move soda, paper goods and chemicals into designated storage areas. Production begins in an ingredient control room. Staff here receive recipes and communicate to co-workers in vegetable and meat production areas how much to process. Ingredient control room staff also portion items, placing them into cold storage areas. This practice ensures the ingredients are ready for cooks when they begin further preparation. In the cook-chill area, staff use 100-gallon and 60-gallon kettles to cook Thai chicken and rice soups and other soups, beef chili, Sta cook menu items to order on a range, chargrill and other equipment at the cooking suite.